In the mid-1930s, it was apparent to all that the battleship holiday would soon come to an end. The existing battlefleets were growing increasingly obsolescent, while the other European naval powers had each laid down a pair of new battleships of their own. 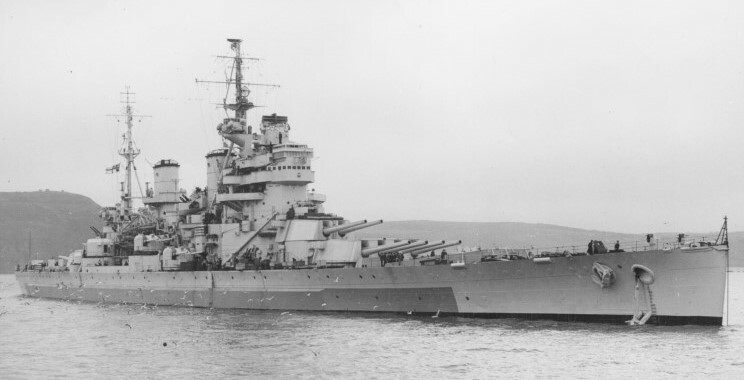 It was expected that the Second London Naval Conference would allow the major powers to resume construction of capital ships, and the British were faced with the need to build the first battleship since the Nelson a decade earlier. The final result, while often overlooked in favor of its American, German, and Japanese contemporaries, gave good service in the crucible of war. Soon, it became apparent that the US would not accept a 12" limit or a serious reduction from the 35,000 ton treaty limit, although the British held out hope for a cut of a few thousand tons until mid-1935. Late 1934 saw the quadruple turret adopted for at least the 14" design series, as a ship with three quads would be 1,200 tons lighter than one with four triples. The increasing threat of air attack and the need for more weight savings saw the separate secondary batteries replaced by 10 dual-purpose twin 4.5" mounts, and the torpedoes were discarded. Despite the fact that it would essentially cost an extra turret, the four Swordfish biplanes5 and a cross-deck catapult remained in the design, ultimately ending up between the funnels. In mid-1935, both slow and fast designs were considered, but after it was pointed out that the resulting ships might serve until the mid-1960s, and that each of the other European naval powers was building a pair of battleships capable of around 30 kts, the decision for fast ships was made.6 The last major decision was on gun caliber. Until October 1935, it wasn't certain what the treaty limit on gun caliber would be, which was a serious problem for the British, who needed to design, build and test new guns in whatever caliber would ultimately be adopted. The last major changes to the design were made in early 1936. A new secondary gun, the 5.25" gun developed for the Dido class light cruisers, replaced the 4.5" at a sacrifice of two mounts, and the armored deck was raised from the middle deck to the main deck. This would significantly improve damaged stability and reduce the volume vulnerable to damage from bombs insufficient to penetrate the armored deck. However, to avoid weakening the armor, something else would have to be sacrificed. Ultimately, it was decided to reduce B turret from a quad to a twin. Unfortunately, this would produce a serious schedule problem. Design on the quad turret had begun in October 1935, but no twin was in the works. The 9-month delay in completion of the ships would be serious with the rapid onrush of war, and it's quite possible that the extra work required of the already overstretched British ordnance designers contributed to the serious problems with the turrets of the King George Vs.
King George V and Prince of Wales were laid down on the day the treaty expired, January 1st, 1937. 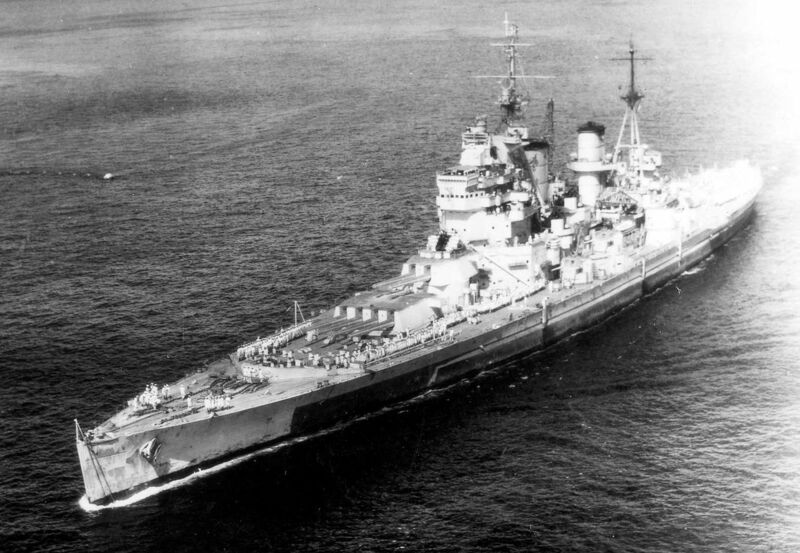 Duke of York, Anson and Howe followed over the next eight months, but the outbreak of war meant that there was almost two years between the completion of King George V and Anson. The final ship displaced about 37,000 tons standard and 42,000 tons deep as completed, which grew by at least 2,000 tons over the course of the war. 745 ft long, they were capable of 28 kts thanks to 110,000 SHP and four shafts, and had a range of about 5,000 nautical miles. The 14" guns fired a 1,590 lb shell at 2,475 ft/sec, with a maximum range of 36,000 yards at the maximum elevation of 40°. These were decent weapons, although they were the smallest guns mounted on any battleship built after the treaty, with the exception of the 11" on the German Scharnhorsts. The secondary battery of 5.25" guns was not particularly successful, as they were slow to traverse and slow to fire. The only area where they stood out was in protection. 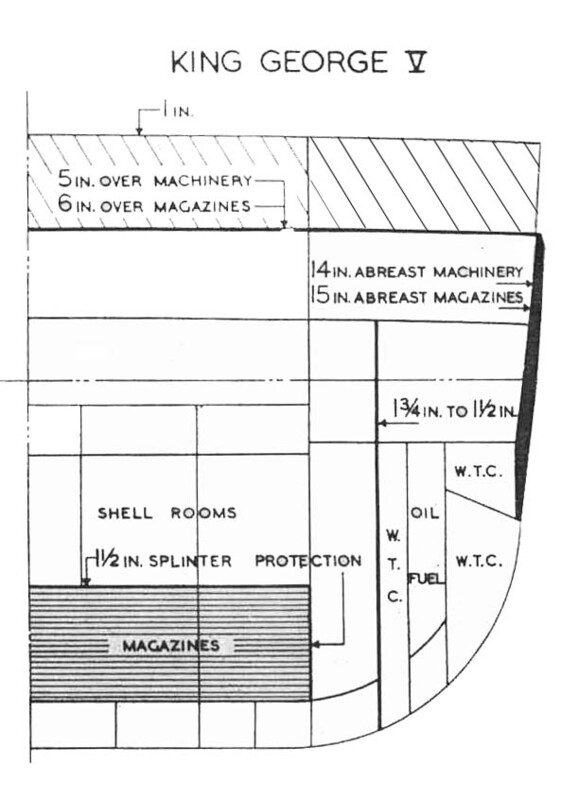 The vertical belt, 15" over the magazine and 14" over the machinery, meant that the inner edge of the immune zone against 15" shells was 13,500 and 15,600 yards respectively. The deck was designed to withstand both shellfire and armor-piercing bombs, with a thickness of 6" over the magazines and 5" over the machinery. This meant that 1000 lb bombs had to be dropped from above 15,000' and 10,500' respectively, while the outer edge of the immune zone was 33,500/29,500 yds. The heavy armor was rendered necessary by the belief that battles would be decided at relatively short range, probably 12-16,000 yards, despite improved fire control and the availability of air spotting. A lower belt was also fitted to counter the effects of diving shells. Their underwater protection, while designed against a 1,000 lb charge, was not particularly effective. It was only 13' deep, and the top opened up under the belt, allowing any explosion to vent inboard. There were a few other, more minor, design flaws. The light AA armament was initially inadequate, although this was common to all battleships of the day. By the end of the war, the aircraft had been landed and replaced by more pom-poms, with the hangar converted into a movie theater. The bow had virtually no sheer7 because of a requirement to fire the main armament at zero elevation directly forward. In practice, this was not a particularly useful capability, and it made the ships very wet forward. All five ships saw considerable action during the war. Prince of Wales engaged Bismarck at the Denmark Strait, and King George V participated in that ship's sinking. Duke of York sunk Scharnhorst at the North Cape, and while Anson and Howe never fought another battleship, they gave good service covering operations from the Arctic to the Pacific. 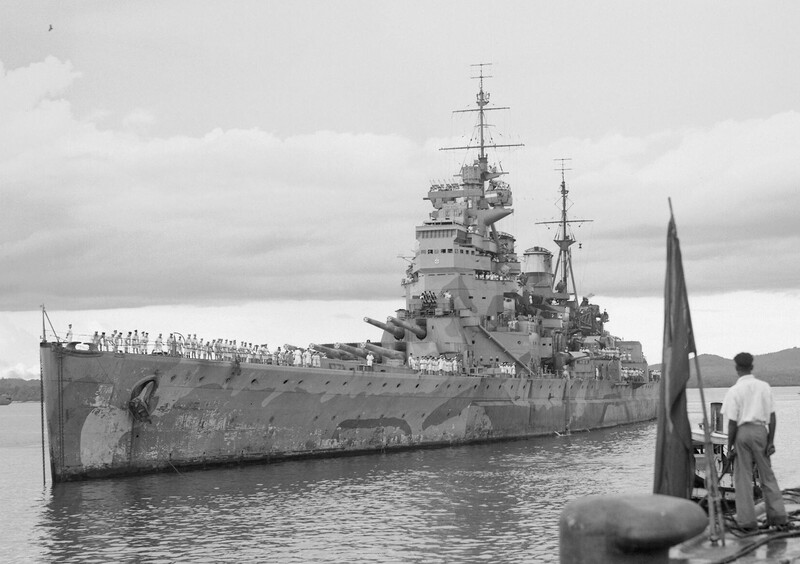 Prince of Wales was the only loss, sunk by the Japanese in the opening days of the Pacific War. So what are we to make of the King George V class? On one hand, they were far from the most powerful battleship class of the war. They were lightly-armed, and their armor was adequate at best. On the other hand, fixing any of these problems would have imposed significant delays on the program, delays the British couldn't afford. In the vast majority of cases, any battleship was vastly better than none, and the KGVs provided a good mix of firepower, speed, and availability. In the three ship-to-ship actions they fought, they gave a good account of themselves, and Prince of Wales landed a critical hit on Bismarck despite her untrained crew and problems with her turrets. Ultimately, it's hard to see how the British could have done much better given the constraints they were under, and the ships were there when they were needed. And that's really all that can be asked of a design. I think you might have addressed this previously, but did the treaty holiday rush the obsolesce of battleships in favor of carriers, or do you think that was mostly a function of the pace of improvement in aviation? I.E. would a world without the battleship treaties have had more emphasis on surface action and less carrier development during WWII? Wouldn't raising the armored deck make the ship more top-heavy? Is it about protecting a greater volume of the ship from downflooding induced by damage? To expand on reRover's comment: Is there anything that would have caused Battleships to come out of the war as the capital ships of choice, ahead of carriers? I'm thinking that a major battle or two fought in terrible weather might have kept the Battleship in prime position for another generation. That's a good question, but I think it doesn't have a clear answer. Without the treaties, I think the shape of the naval war would have changed enough that we can't draw firm conclusions. It's probable that there would have been a war in the Pacific earlier, which would have privileged battleships over aircraft. I'm really not sure how this would have connected with events in Europe, but the European theater was more battleship-centric anyway. I'm not sure downflooding is quite the right term, but pretty much. If the deck is low down, then water can start to get over the deck edge which basically kills stability. I don't see any circumstances under which you can get the battleships coming out ahead of the carriers as the war's premier capital ship, short of stopping the war in 1941/keeping the Pacific quiet. At best, you can have them come out with a much better reputation and a stronger appreciation among nonspecialists for the limits of carrier aviation of the day. And aviation was going to keep advancing, even if there was less reason to drive the specifically military side of things, so I don't see any way to get another generation, particularly one of battleship dominance. I do think that from the perspective of the battleship, the war was pretty bad relative to what it should have been. If TF 34 had been detached during Leyte, for instance, the postwar reputation of the battleship would have been a lot stronger. Samar was incredibly implausible, and I suspect that in that alt-hist, historians would be constantly having to say "no, the Japanese probably couldn't have destroyed the entire invasion force if Halsey had left San Bernadno Strait uncovered". Which is a big boost to the apparent utility of the battleship. As would a major bad-weather battle or two. But that buys them an extra decade or so, until you get nuclear SAMs and all-weather carrier aviation, and they're still playing second fiddle to the carriers during it (this is almost what happened IRL). You might get an extra 5-10 years from delaying those innovations if you don't have someone like the Soviets driving the pace of military R&D to the frantic heights of the 50s. But that takes us to the late 60s at the latest, which is not entirely coincidentally when the battleships would have been reaching the end of their service lives normally anyway. I expect this to reverse sometime around 2030 when laser weapons go into widespread operation and nuclear-powered battleships will have MUCH BIGGER AND FASTER LASERS to kill all aircraft in line-of-sight before the aircraft can sink them, but I'm not holding my breath. I would point out that until after the war, it still took a lot of airpower to sink a battleship. Like, multiple carriers worth. 1 CV vs 1 BB has probably even odds of the battleship going away damaged and the carrier having to run away when its strikes fail. (Keep in mind that air power in WWII is a wasting asset, because planes break, crash, and get shot down.) But you are correct about ranges, and that's definitely why I don't see battleships coming out of the war on top. It's worth noting that at the Sibuyan Sea, quite a few American carriers went up against four battleships and only managed to sink one (Musashi), which is not the impression one usually gets -- BBs with late-war AA suites could be very difficult targets. Though I do wonder if anyone ever did a study that discusses just how the Americans managed to not coordinate attacks there very carefully. The Taffy Three airstrikes managed to wipe out quite a few cruisers, but no BBs. Significantly harder targets. Tend to agree with you that 1 WW II CV vs 1 WW II BB is not likely to sink the BB, barring really good torpedo strikes and/or golden-BB hits. That poster is perfectly sensible. It was just drawn before they decided to raise the armored deck. That's not an action I'm particularly familiar with. I really need to return to dissecting Leyte, but the muse hasn't been steering me in that direction lately. There's a lot of stuff to cover before Leyte. Thing is, most writing about Leyte focuses on either the heroic stand of Taffy Three, or else the death ride of the oldest Japanese BBs at Surigao Strait. Nobody writes about the Sibuyan Sea or Cape Engano, as far as I can tell. You might have an open field where not much is known, or at least not much is in the popular awareness at all. I request a post on nuclear Sam's, please. That would almost certainly be tied in with a discussion of the 3T SAM system, which is on my list for "eventually". There were some interesting aspects I know of offhand.